​I was introduced to this poem through the music of Josephine Foster, who has an album completely devoted to the poems of Emily Dickinson. Since one of my more well-known craft focus areas has been broom-making, this poem understandably grabbed my attention. The words of this poem, in which Emily Dickinson uses a sweeping housewife to describe the sunset, have been swirling around in my mind for the past few years as I’ve pondered how to incorporate this into broom-making. My mentor in the Artisan Development Program (in which I am currently participating at North House Folk School), Dennis Chilcote, who is also a broom-maker and has added some beautiful carving to broom handles, challenged me a few months ago to broaden my vision of artistic brooms by making brooms worth more than one hundred dollars. A few ideas have come to mind since then, but the one that has excited me the most has been the opportunity to incorporate “She Sweeps with Many Colored Brooms” into a series of twelve brooms. Tackling one line at a time, I’m working to create a visual representation, either figuratively or literally, onto each handle. I am then carving the line of the poem into the handle using free form chip carving methods, which I’ve also been using on my recent shrink box projects. The first handle that I completed is “Till brooms fade softly into stars –“. This handle I first painted with a deep blue oil paint to represent the evening color after the sun has set and the red and orange have faded from the sky, but before it is fully black. I then carved the words through the paint and finally created my stars. 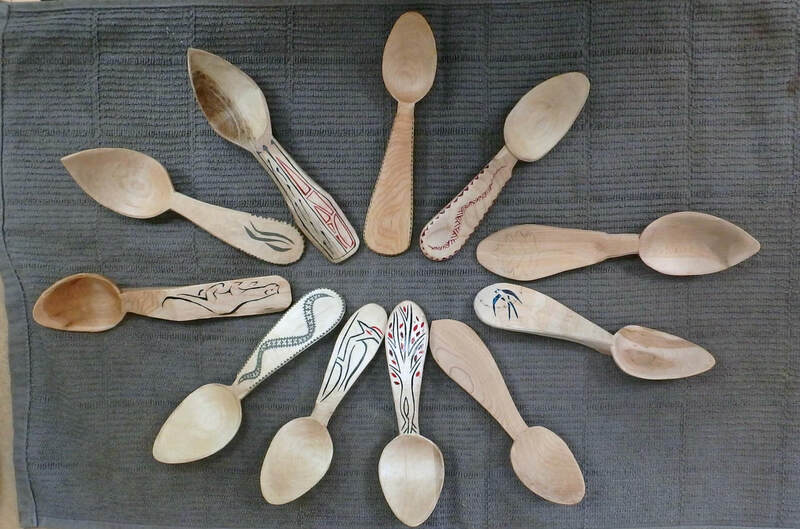 For this, I used a method that Jane Mickelborough showed me at the Milan Spoon Gathering, and which I used in a couple spoons that I carved in her class. Using brass and copper tacks, I cut short lengths, sanded them down, and tapped them into pre-drilled holes in the handle. I then used a combination of chip carving and a stab knife to add lines to represent sparkle around each star. I finished the handle by painting light gold into the carved letters and chip carving around the stars. ​My plan with this handle is to tie a broom onto the end that incorporates dark blue broomcorn fibers along with yellow or gold crosses over the blue string used to tie the broom flat. So far, I’ve completed three of the simpler lines of the poem and have lots of fun and more intricate ideas for most of the other lines. I love that this project is allowing me to experiment with a variety of carving and embellishing methods, as well as new paint types and techniques. 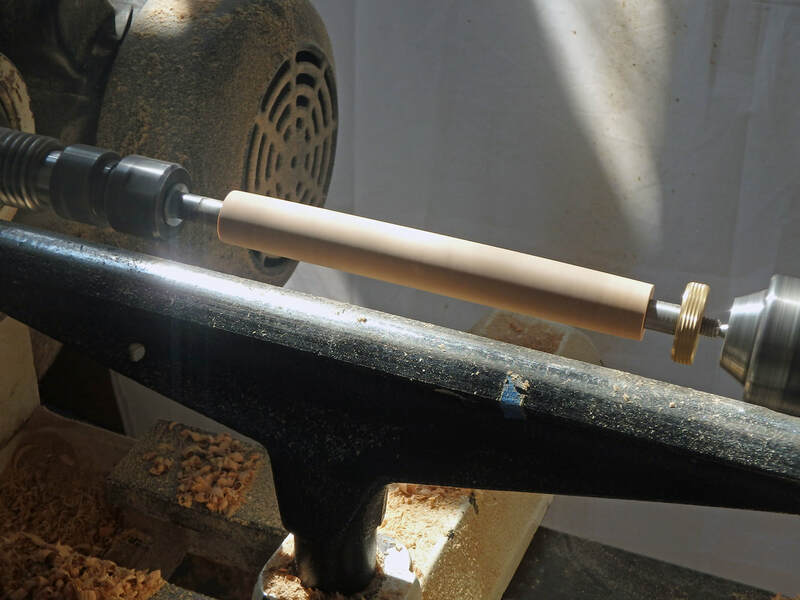 I’m not sure exactly where the final products will end up or how this project will factor into my identity as a broom-maker, but I appreciate that the Artisan Development Program is allowing me the time to follow my whims and work on projects like this. ​Surface design, be it carving or painting or inlay, is fascinating to me. Just a simple embellishment can bring an everyday item from being strictly utilitarian to the status of usable art that can be enjoyed both while in use and while being stored on the shelf or hanging on the wall. I’ve lately been delving more into the world of surface design, focusing over the past month on freeform chip carving and various painting techniques. Chip carving is generally defined as a method of carving in which one makes angled cuts into the surface of the wood which results in clean chips being cut away. The chips are removed in such a way that a form or pattern takes shape, often quite geometrical in nature. This picture of an old wooden dustpan that was lent to me (and which I hope to replicate sometime soon! ), shows two typical chip carving patterns that are often repeated in traditional Scandinavian chip carving. 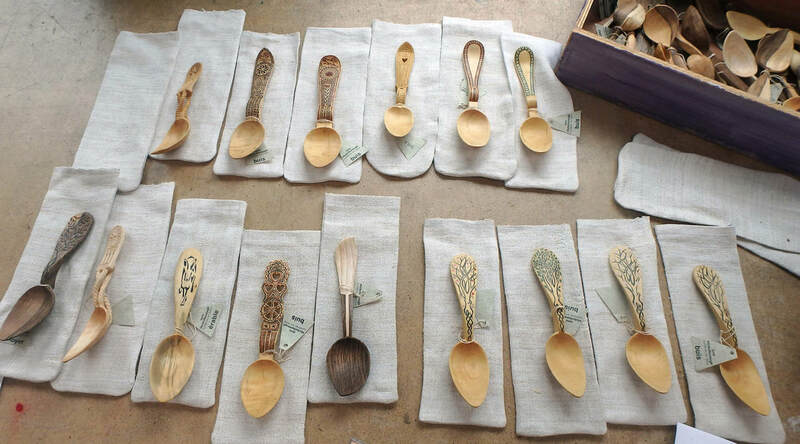 Though there are examples of a huge variety of chip carving methods and techniques from around the world, this one was common in Scandinavia during the 1700s and 1800s as a method to decorate chairs, tables, clocks, spoons, and many other household items. A quick online search will give you an idea of how intricate some of these designs can get and will likely lead you down a rabbit hole! One of the things that I love about this method of embellishing work is that it generally only takes one or two small knives to achieve a huge variety of shapes and patterns, so it is extremely attainable for those with limited budgets. ​Although I’m intrigued by geometrical styles of chip carving, I’ve been mostly exploring what is referred to as freeform chip carving, which generally takes the form of long flowing lines combined with smaller shapes to create designs that mimic the natural world such as plants, animals or really anything you could imagine. I’m still on the shrink box journey that I wrote about in my last blog, and these little containers are the perfect project with which to explore chip carving. Over the past couple weeks, I’ve been making a bunch of spice jar sized shrink boxes and I am now using chip carving to add the name of the spice and an image to each jar. Below is a series of photos showing the methods I use for carving into these little containers. 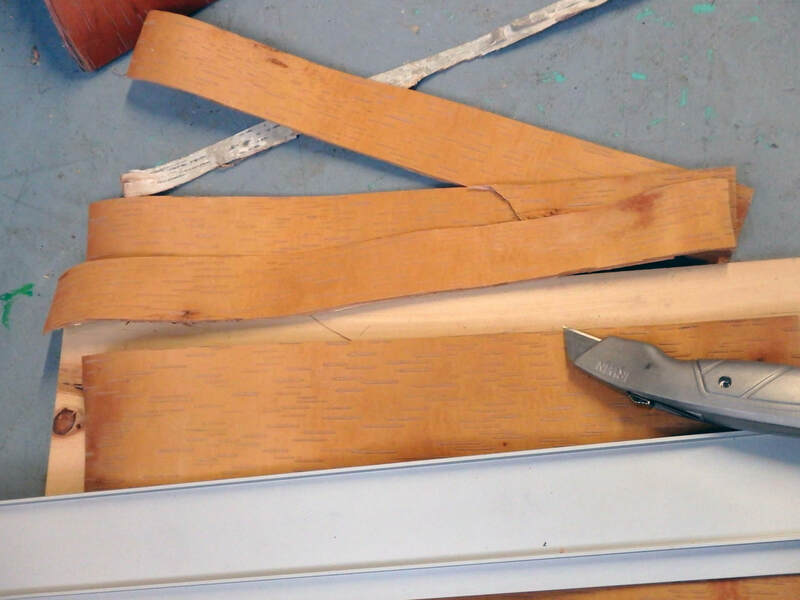 After penciling the design, I use the chip carving knife to slice out long smooth cuts, doing my best to meet the bottom of each initial cut with a paired cut that leaves a clean line in the wood. Tight corners are still challenging, but it’s fun to push the limits. ​​After finishing the carving, I get to explore paint and color. I’ve been working with milk paint, acrylics, and oil paint to learn about the various finishes and methods required to achieve the look I’m trying to obtain. I’ve been having a lot of fun mixing colors and using teeny tiny little brushes to fill in the letters and images. I’ve been called crazy by numerous people so far, but I just love painting the little details while sitting in the studio listening to music or an audio book. ​​In addition to my ongoing spice jar adventure, I’ve been continuing to play around with different forms of shrink boxes. I want to make square or rectangular ones for storing loose tea, so I made a small square shrink box as a test run on how to hollow it out and how to cut the groove for the base into the very corners of the box. With my trial run finished, I had a little box that was in dire need of some chip carving decoration. I wanted to try out the method of painting the box first, then carving through the paint so the bare wood creates the pattern. I painted the box in a deep purple-ish blue then carved the image of trees through it using the combination of long smooth curves and smaller pointed ovals. Though there were no tiny details for me to paint with my little brushes, I really like the results and plan to continue exploring this method as well as many more. Summer is quickly winding down, the colors of fall are covering the hillsides, and my wood stove is again warming the chill from my cabin’s hand-hewn timbers. With the cooler weather and shortening days, I’m finally finding more time to hole up in my corner of the studio and play with the ideas that have been floating through my mind all summer. To further my skills in embellishment carving, one of my main goals while in the Artisan Development Program, I’ve decided to spend some time in the world of shrink boxes. 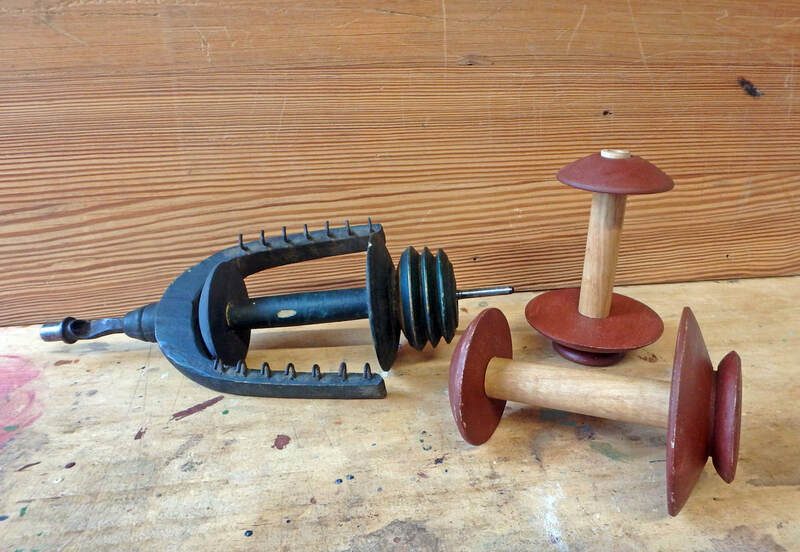 Though many people in the traditional craft world are familiar with these amazing little containers, many are not, so in a nutshell, these canisters are created by hollowing out a recently cut log, cutting a groove on the inside of one end, and popping a base made from a dry piece of wood into that groove. As the hollowed log dries, it shrinks around the dry base and creates a tight seal. Carve a tightly fitting lid and you have a perfect container for various food items, storing craft supplies, or whatever else you can imagine. Since my main focus with these containers is embellishing them, I’m trying to find some ways to make the process quicker so I can break out my chip carving knives and gouges for relief carving and explore to my heart’s content. 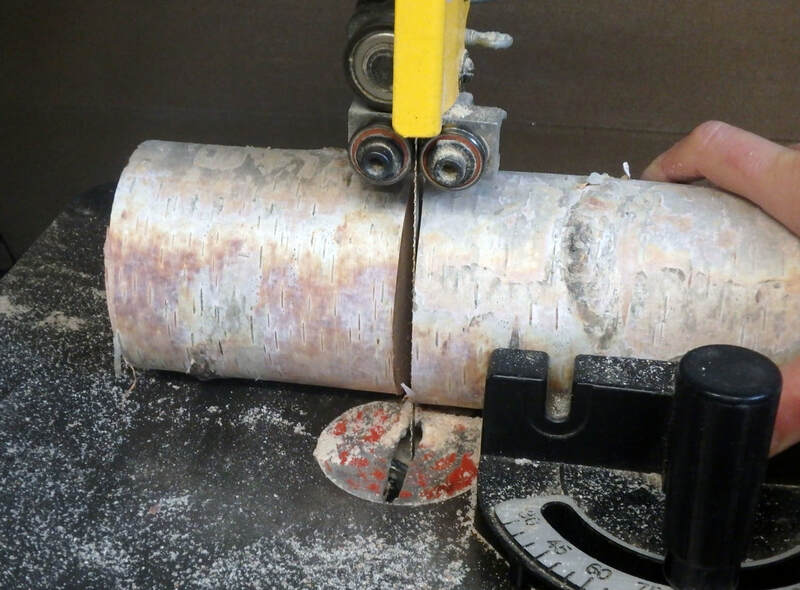 ​​This allows me to mount the log on the lathe using expanding jaws that fit within the hole and widen to hold the log in place while I turn the main form of the shrink box. 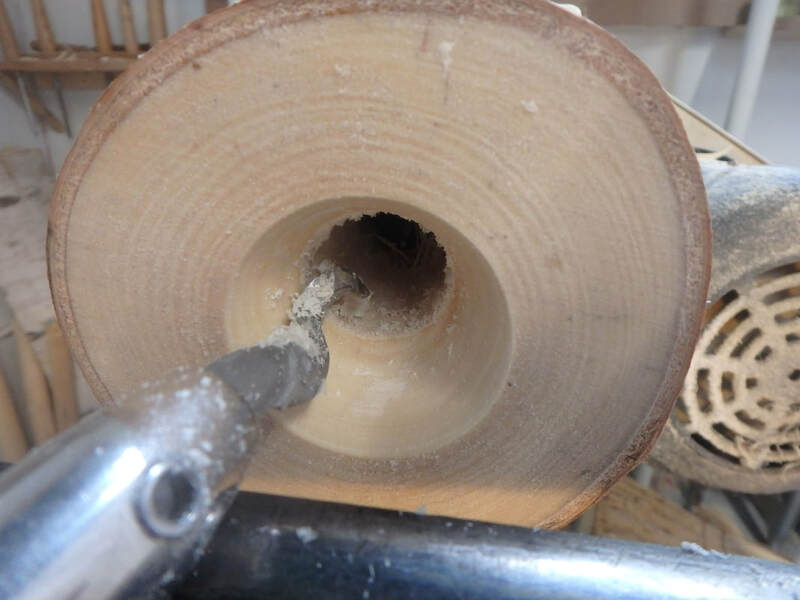 End grain hollowing can be more challenging for me than some other styles of turning, but the initial hole made by the forstner bit creates an easy start to further hollowing with a hook tool. 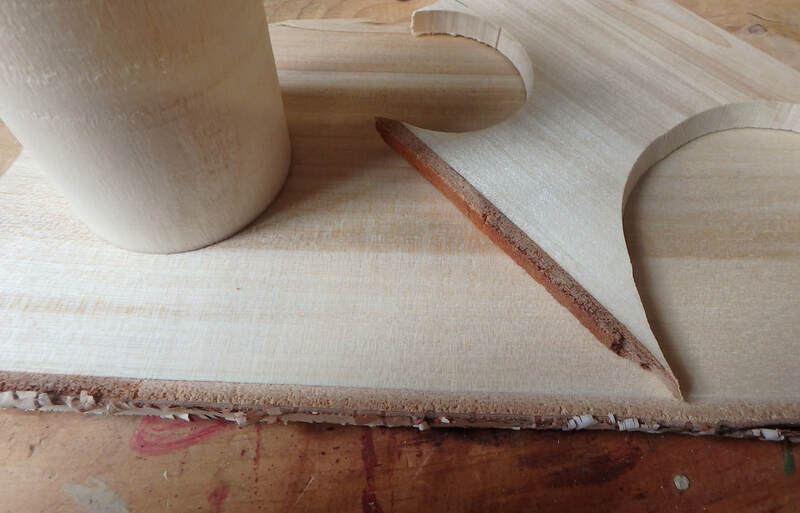 Once the inside is widened to about 1 ½” I use a skew chisel to create the groove that the base will fit into. 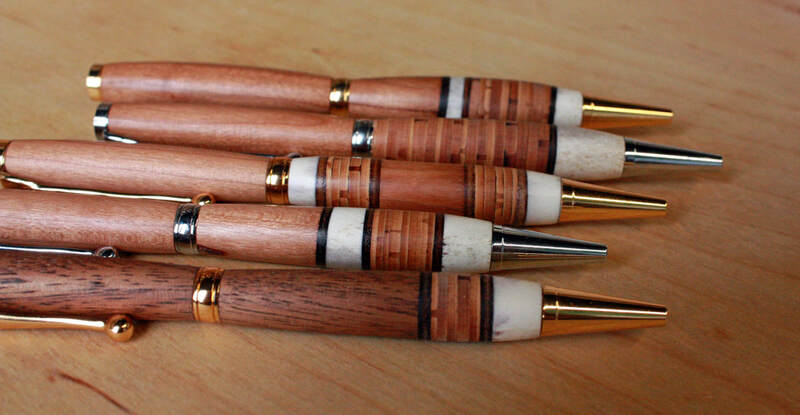 By hand this process can take some time, but on the lathe it can be completed in seconds. After the inside is complete, I take the outside down to my desired 2” diameter with a spindle roughing gouge, not being too concerned about the finish it leaves because I will later carve the shrink box for a hand tool finish and more desirable surface for the embellishment carving. 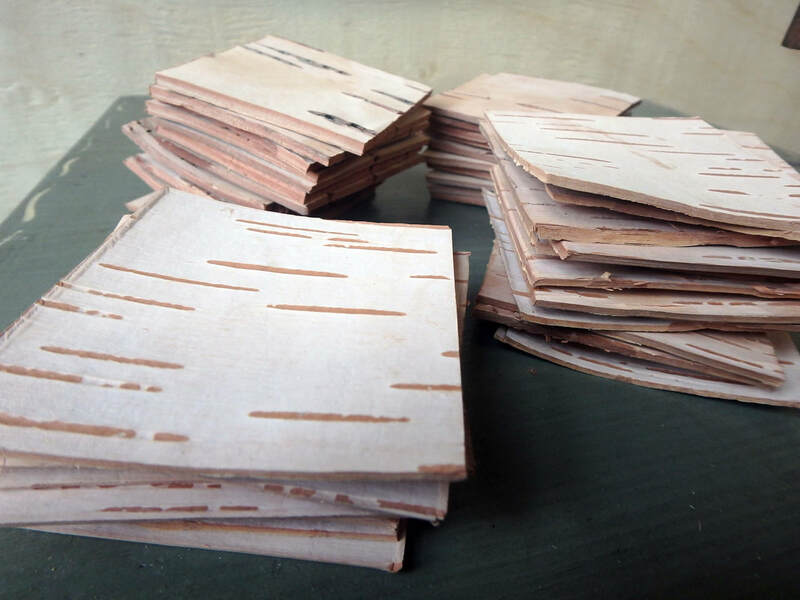 ​To create the base, I pull out some thin slabs of birch that I rived out and planed down a couple years ago when I first explored the world of shrink boxes. I trace the inside of the box onto the thin piece of birch, cut it out and carve the edges down to fit into the groove that I created. Then I POP! the base into its groovy home and set it aside for a week or so to dry out and shrink around the base. When I return a couple weeks later, I carve the outside of the box with a sloyd knife and use an incannel gouge to add a nice finish on the inside of the shrink box. This is an amazing gouge that my mentor Dennis Chilcote introduced to me and has graciously loaned to me. As opposed to a more traditional carving gouge which has the bevel on the outside of the curve, this gouge has a bevel on the inside. This allows me to run the length of the gouge straight down the inside sides of my shrink boxes, allowing me to get deeper into them with a more consistent cut than a gouge with the bevel on the outside. Then I am free to explore, using freeform chip carving, similar to what I did in the Bretton Spoon Carving class I took earlier this year with Jane Mickelborough, or relief carving, similar to what I explored with Else Bigton at the February Artisan Retreat, and with Jock Holman while serving as a class assistant in his Timber Carving class. ​I’m excited to see where this shrink box journey leads and look forward to the day when the conglomerate of mismatched glass and plastic containers on my spice shelf are replaced with a full set of colorful and artistic wooden containers. This past weekend a group of folk artisans working in varied media (mainly wood, clay and metal) descended upon the farm of Phil Oddin and Else Bigton, renowned carvers and instructors at North House Folk School. Their farm serves as their home, shop and dressage training center, as well as our weekend getaway. Check out some of their work here. They have hosted such gatherings in the past with their peers but decided that as they are slowly winding down their livelihood of carving it would be inspirational and informative to include the younger generation of people who are making a go at it. Various people came and went, visiting just for the day or staying for three or four. Together we worked on carving and building projects in Else’s shop, shared meals, and drank coffee and beer (in the morning and evening respectively), and delighted in the amazing collection of carving, pottery, tapestries, wood block prints, furniture, and books that Phil and Else have amassed over the years. We played Musical Kubbestols (traditional Scandinavian chairs made from a log) to find the one that hugged our body just right, and watched the sun set over the freshly fallen snow from the warmth of the kitchen. Conversations revolved around the sustainability of making a living in craft, regional traditions, the nuances of travel in Scandinavia, mentorship and apprenticeship in a modern context, and the demeanor of trolls. ​On a more personal level, Phil helped me understand more fully some of the carving history in Garmo, Norway, the small town from which I received my family name and which is only 50 km from where he and Else went to school for woodcarving and furniture-building in Dovre. Else inspired me by drawing out Acanthus motifs that would fit well on my handled wooden bowls and taught me some introductory surface carving methods to help me on my way. ​I drove away from the farm with my hands itching to carve on the bowls I am turning and to experiment with some ale bowl designs inspired by the Tokheim stoneware around their home, and with my mind brimming with questions about life, craft and how it fits into my personal experience. I’ve recently been spending a lot of time with professional craftspeople and teachers, and as the weather cools and the winter solstice hovers just around the corner, there is much discussion of our winter hibernation. ​Now when most people think of hibernation, they think of the winter slumber of bears, or the below-zero body temperatures of the arctic ground squirrel. But when craftspeople speak of hibernation, we’re thinking of that cold, dark time of year, when most people are hunkering down, but when we are active and excited – hard at work next to the vibrant heat coming from the wood stoves in our shops. We’re thinking of the conversations with other craftspeople, the freedom and time to create new things or try out different methods, the excitement and joy of catching up from the last year and hopefully getting ahead for the next. The life of a craftsperson, especially one just getting started, is a busy and often overwhelming one. We’re still striving to perfect our craft, but are also engaged in so many other interesting endeavors, some of us may be working another job to make ends meet, we’re trying to figure out the markets for what we make, what stores are a good fit for our products and which art/craft festivals are supportive of our work. Sourcing materials may still be a struggle as we try out different suppliers or harvest methods, and packaging and shipping orders may yet be inefficient until we have the appropriate setup. Spring, summer, fall, and early winter are filled with teaching at Folk Schools, selling at festivals, working seasonal jobs, accepting custom orders, and stocking up for the winter holiday rush. ​And so after the holidays have passed, when the world is dark and cold, we feel a weight lifted, free to create, pursue our passions and refresh our minds and spirits for the coming year. For those of you who have visited the Traditional Necessities website or Etsy page before, you may have noticed the recent disappearance of Kerry’s name. Don’t worry – there has been no major life crises or rifts! After a lot of careful consideration, Kerry has decided to follow a slightly different direction when it comes to how to pursue his livelihood. I won’t go into details on that front, but do want to convey my deep gratitude that he was there as a friend and business partner when the dream of Traditional Necessities was first being schemed and realized. It was so much less intimidating to show up to our first few art festivals as a team – having each other’s back, bouncing ideas off each other about website design, business cards, and the overall landscape we wanted the business to paint – what our morals, expectations, examples and goals would be. ​I am thankful that Kerry will continue to be influential in my continuing development as a craftsperson and will thus continue to inspire the crafts that results. As time moves forward and I continue to pour my blood, sweat and tears into Traditional Necessities, I hope those that visit my shop will continue to be inspired by the work that I do, and that I will in turn continue to be inspired by others.